We played a one off scenario today designed by MTG. The situation was that an Austrian Corps was to hold back a French Corps from 2 bridge crossings behind their lines. Sort of Aspern Essling in reverse to a small extent. I was nominated to be Austrian C-in-C which i have begun to suspect is a role that nobody really seems to want! On my team we had MTG, Wittman, Mark, Spoom and myself. Facing us were Morsey, Palmer, Little Mac, and Pepe, the latter of whom was C-in-C of the French. Shown below is the initial scenario setup. Given that our objective was to hold the bridges near the "star" objective area, I didn't like how far west we were deployed. I felt that this opened up our flank to turning movements from the north or the south. I ordered both Mark and MTG to fall back and deploy off of the right and left flanks respectively of what was initially our reserve division, but was now our center. Wittman from Mark's division was ordered to take up ground on the extreme right and Spoom was detached from my division and ordered to move to the extreme left of our line and placed under command of MTG for all effective purposes because the distances precluded from my giving him direct orders. These forces were initially meant to be positioned to counterattack the flanks of any French assaults in their area, but as it turned out backing up our line and stretching our flanks proved critical to the overall play of the battle. I ordered Mark to take his division BEHIND my division and rush to direct support of MTG/Spoom. I would take my brigade and advance it and swing to the left and press on the exposed French left flank. As it turned out however, Mark advanced with me on the exposed French Left rather than going behind my line. in the end, this really worked to our advantage i think because we were able to really crush the French Left commanded by Morsey which was most definitely "in the air". In the end, it turned out to be a spectacular Austrian victory! The score revealed an 18,000 point difference, something I'm not sure i've ever seen before. While, you'd have to get the French side of the story from Pepe and his team, to me our victory was based on the following key factors. 1. My decision early on to pull back our main line from it's forward positions. This prevented the French from getting around our flank which was clearly their intention. 2. More important than 1 above was MTG's and Spoom's ability to each effectively manage the tactical situation and hold off far more French troops than they had to give us time to react and redeploy our northern wing to the south in a counterattack. 3. The ferocity and relentlessness of Mark's counterattack. He mercilessly pushed the French and drove Morsey off and then caved in Soldier along the river effectively cutting Palmer off from the French line of communication and pretty much sealing his fate. As you can see at 4:45 we had a 6k, point lead, but 40 minutes later we had an 18k point lead such was the ferocity of Mark's attack driving the French into the river. Overall it was a good team effort with everyone pulling their weight and contributing equally to the win with particular kudos to MTG and Spoom for blunting the main french assault and holding out long enough to give our counterattack time to develop. I'll be curious to hear more about the French side of the battle. Yet another fun game and after it was done i was shocked that FIVE hours had gone by since i sat down. I won't mention the 17,453 courier message windows i had to close, I swear I was ready to hang myself and I think perhaps i now understand why folks don't want army command! I totally agree, you hit our weakest spot, as Morsey was already in trouble before you came in. The score of the CiC is the total, as it includes all players in the team, which it is big enough. Congratulations to the Austrian team for their crushing victory. I assume the full responsability for the performance of the french forces. It was not my finest day. My plan was to attack from south to north with Mark/soldier crossing the river at its southermost bend and advancing east of the river, Ron/Palmer in the center moving west of the river and Mike Morsey being left flank moving on the Ritterburg road towards Klernitz. I instructed my commanders to keep their divisions concentrated and fight on a narrow front. I think MJP's 3rd image is the best to explain my point of view. When we met spooms brigade it seemed the southern end of the enemy line, so Mark was called back with the corps. 1) Our divisions arrived and where commited piecemeal to the fight some brigades and most of the artillery were very late to arrive. So we made very little use of artillery during the whole battle, and we had none the last 40 minutes of the battle. 2) Some of the crucial orders I gave were not as precise as they should have been. a) Ordered Morsey to attack the austrians north of the Dobromi road. I meant him to support Ron's attack on spoom's brigade in the woods. And Mike got his division to gallantly attack MTG's line behind. Too late to do anything about it, I saw that his division was forming a long line and realized he was going to get into trouble unless he could neutralize the austrian batteries very quickly. b) With Morsey's command reduced to some battleworthy battalions I went back with the other 2 divisions. They were getting the upper hand, the austrians were pulling back their guns, and there was a hill covered with bodies where Kevin's battalions where still giving fight. The Austrians were mainly to the northwest of our position. I ordered both Ron and Mark to start moving towards the bridges (northeast). I wanted them to do it fighting and together, when I realized Ron was on the other side of the river and this time the austrians hit Mark's division alone, without artillery and outnumbered. So I did everything in my hands in order to give my commanders and troops the best chances in the fight. One final thought, I already mentioned Austrian artillery was much better used than ours, but Austrian's cavalry superiority was insulting, from my point of view they were causing havoc all over the battlefield. I hope with my commanders input, there are still some more lessons I will learn from this engagemet. Sounds like you all had a great game. I hope to be around for tonight, 20:00 UK time. Matt - great battle report, and brave of you to accept army command on only your 3rd game. So pleased you are enjoying these games, I feel you're a big asset to our community. Hope you enjoy many more. *The turning point was when our left began to crumble. We were still far from our objectives fighting on ground quite favorable to the enemy. Pepe urged me to the northeast and to avoid engaging the Austrians coming down on our left/north. Soldier was also seemingly moving in that direction. My own command was in decent shape though down several hundred casualties after the fight in the woods. So, after dispatching a few couriers, I pointed my battalions toward the south bridge. Once there, couriers were fired off to Mark and Pepe (though no direct replies were ever received, so I could not be sure these messengers actually found their destinations). In any event, it was clear our French tide was ebbing, so I thought a last bold stroke was in order. I deployed 2 brigades at the south bridge while I took a third to the north victory location. No enemy there, so it was left there and I moved back to help command my boys at the final, desperate fight for the south bridge. *At first, things appeared to go well at the south bridge. Soldier was doing all he could to screen the enemy. On Pepe's order, my brigade posted just east of the bridge was brought west, and my other beat up brigade sent the first Austrians to arrive on the scene packing. But then the full weight of the Austrians descended and we were done. Our earlier losses had finally come home to roost. Congratulations to the Austrians for a victory well-earned. Per usual in this format, most of the day was spent with a true understanding of about 15% of what was going on. This is, of course, both the beauty and frustration of KS HITS. And don't believe Pepe's statements about his own performance. He did a great job with the available information! The scenario design was wonderful, presenting real challenges and tough decisions to both sides. My only regret was that there were not enough players to make the size of the commands more manageable. When it comes to controlling troops, I personally find it much more enjoyable to lead a brigade than a division of 10k. When the formations are so large and unwieldy, I end up controlling one brigade pretty well, the second with a squinty eye, while the 3rd (and sometimes the cavalry and guns) are more-or-less pointed somewhere with sincere best wishes for success in the future. I think the Austrians in this one had a big advantage in their organization. They had the luxury of being able to farm out brigade sub-commands for 2 of 3 divisions. The additional flexibility and command-control this provided was a big advantage. Anyway, a great day and great fun. Thanks to all! I woke up to check the forum about yesterdays battle. Which regardless of the results, was very fun and great way to spend the afternoon. Pepe it was not your fault it is just how the cards fell. I thought I had the flank when Pepe ordered me to attack, I was charging across the field, only to turn and see a whole bunch more show up on my flank moving towards my rear when I was committed. it was a messy withdrawal. I had intercepted some couriers and they message said the the SE was having a tough time. I tried to withdraw slowly hoping to keep the Austrians occupied. As I pulled back I literally saw my army dissipate before my eyes, although I kept the Austrians in tow there was just to many of them. Finally linked up with Lil Mac and we tried to hold them off, my army was down to just one beaten up brigade. The rest is history! I would only have 2 things to say. 1. Pepe you did a fine job!! I am sure that there was probably some miss communication between us. Maybe just a little more info in your messages, (if you send a message about troops to my flank maybe include troops strength info) but that would not have changed the out come of this battle. I was surrounded and doomed and still had fun!! I am sure a bit more information will help in battles to come. I am going to finish my coffee now and may you all have a great day! I know Kevin likes to use the courier message system to its full potential to move his AI formations but I chicken out of doing that and use the command map. I select the brigade/battery officer I want (if I'm commanding a division) and often TC him for the early part of the battle which is usually the approach to contact phase. With the required officer still selected the command map is brought up with the N key and you then simply click anywhere on it and the commander begins to march there. He'll go on his own if you give no other order so next I select a formation order for the brigade or battery. Finally I select 'use roads' if I need that option. I give no facing orders initially and issue those when I arrive at the sharp end where things are happening. Unless I'm C-in-C or the boss wants me to ride off somewhere to recon I'll ride just ahead of my lead formation so I can act as traffic cop at the place they arrive and get the division into a suitable formation. To stop my brigade commanders doing what Morsey's did in our last Russo-French battle I keep them TC'd until I send them into the attack, when I'll use a courier page message to give them an appropriate stance. Often 'probe the enemy' is enough; you can completely lose them if you order attack or full out attack. Can someone please post up the replay file for yesterday's game? I thought we had it won. I went to screen for Ron as he moved his division to hold the objectives. Then I saw a mass of cavalry and infantry coming for me. I never got my guns in a good position, which is crucial if you're on the attack. Fortunately, the Austrian guns weren't in position to pound me too bad. My cavalry performed well. My infantry had no chance against the horde that swallowed me. Ron and I never got coordinated in our attack. Pepe ordered me to not cross the river and come up on Ron's right and drive down the west bank. But I didn't have room to deploy. With hindsight, I should have marched my infantry past Ron's right and then deployed. That would have reversed the line and we might have had a chance. I need to teach MJP my leadership style. He was too calm. I saw him on top of the hill sitting on his horse giving orders. I would have been flailing my arms about like a lunatic. Granted, not nearly as effective, but much more entertaining for Kevin. Thanks Martin that is what I will do for now on. That should be the right file. Soldier wrote: I need to teach MJP my leadership style. He was too calm. Seriously, MJP did a great job. Now, we just need to get him into a map command in the Peninsula Campaign. P.S. Those new to the format and the full use of couriers may not realize that all intercepted courier messages are presented to all enemy players at the same time, regardless of whose troops actually did the capturing. So, all players on a side are getting bombarded by the same bazillions of captured messages. Compounding the problem is that when a messenger is off'ed carrying even a futile order (e.g., retreat from a melee), SoW has the charming habit of immediately dispatching another...and another... hapless horseman to meet the same fate. So, it is easy to see how a seemingly endless stream of worthless, captured messages is broadcast to everyone. P.S.S. Note to self: Next time MJP is set to play on the opposing side, remember to send endless couriers into some melee -- and a package of razor blades to MJ before the battle. Pepe wrote: One final thought, I already mentioned Austrian artillery was much better used than ours, but Austrian's cavalry superiority was insulting, from my point of view they were causing havoc all over the battlefield. That's exactly what I thought about the French cavalry. In the southern end of the field, they came on at the start of the fight and forced our battalions into squares. Right behind them was their infantry. They were deployed into line and began shooting apart the squares. Very unsportsman-like. I was just very glad no French artillery was nearby. Here is a tip for handling the cavalry. At the start of the game, give the brigade commander the "hold" stance. Place them behind the line of your infantry. They will stay out of the fight unless they are directly threatened, (enemy approaches within 100 yd.). When the fighting has commenced and the enemy is pushing hard on your line, switch the stance order to 'defend'. Now the cavalry will charge any enemy unit that breaks through your line and gets within ~150-200 yd. Once they do charge the enemy, they will tend to continue doing so until they either rout off the field or run out of targets. Fairly realistic. Sometimes you can re-establish control by ordering the cavalry commander back behind the lines while giving him the 'hold' command again. I got my dander up. After sending MJP several useless messages about how our right flank was "in the air" I saw that, in fact it was the French Left which was vulnerable. I immediately attacked...... and then remembered my orders to go more south . I should be cashiered from the army. I thought, crap look what I caused when I saw our entire left flank collapsing, so, more out of desperation to retain my commission, I began an immediate counter-attack. I led several cavalry charges into masses of French skirmishers which were dropping the French, 500 at a time. Once I took the crest of the French ridge I moved my gun directly up to the crest in front of my lines and literally blew holes in the French. I ordered all my commanders to all out attack and I sat back and TCed several regiments to hit and resistance points. You are worried about your commission. I was the one that you slaughtered, you can add me for a reference. Good to get a better understanding of the French side of the story. Truth be told, my biggest worry during the battle was not our flanks, which I felt were secure, it was our center which was extremely thin. My fear was that the enemy would simply position itself directly west of the Objective and mass it's way through the division i was controlling which was simply a brigade, a cav brigade, and two batteries. As MTG and Mark can attest, during the 45 minutes of our redeployment i was constantly urging them to tie in very closely to my left and right such was my fear about this. Again, sort of reverse Aspern Essling with the French this time ignoring our weak center and attacking our strength out on our flank. A few other thoughts in response to some comments. "I think the Austrians in this one had a big advantage in their organization. They had the luxury of being able to farm out brigade sub-commands for 2 of 3 divisions. The additional flexibility and command-control this provided was a big advantage." This is very true and i feel we utilized this advantage to it's maximum potential by positioning our players with brigade control only on the very flanks of our army. Detaching spoom south in particular and effectively attaching him to MTG not only gave me as C-in-C one less thing to think about, it also effectively gave MTG a human sub commander. Same thing in the North until Wittman dropped. So we utilized this effectively I feel. MTG was the only player on our side with a full division and playing defense with a full division is much easier than attacking. In retrospect, the Austrian deployment was a good and strong choice, but if we French "had only known" ahead of time, I think Pepe's original plan, with some slight modification, would have had an excellent chance of success. 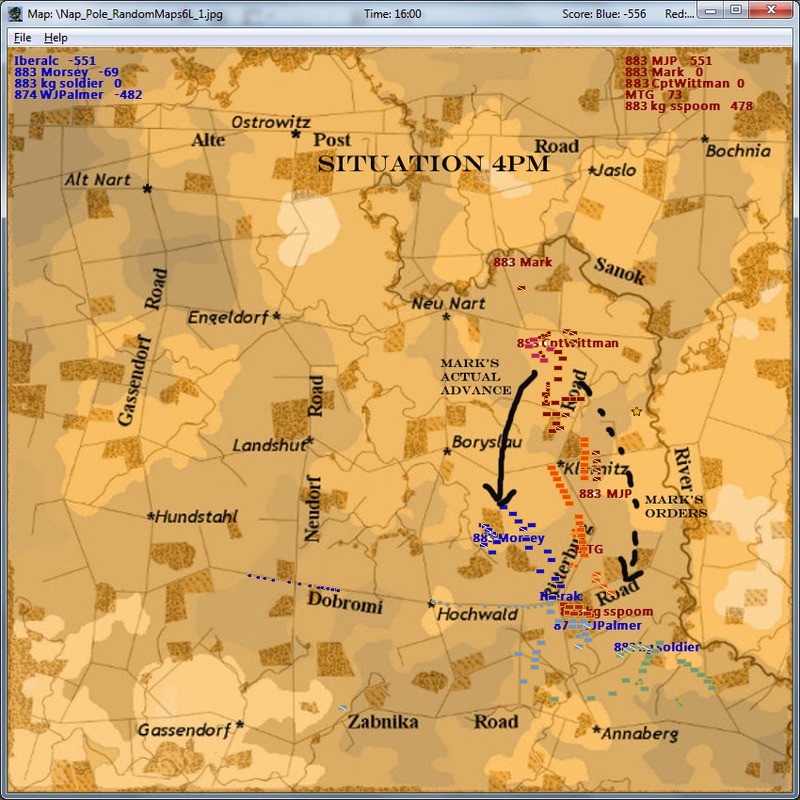 The French left could have acted to screen the Austrians deployed so far west, while Mark's force would have had a relatively unobstructed path to the victory locations. This would, I think, have turned the tables and forced the enemy to attack us on ground more of our choosing. As it was, we became embroiled in the fight at the initial contact point, which quite favored the Austrians. They had both elevation and artillery advantages. As I said in my initial battle report, i think our decision to redeploy into a solid battle line further back was a good one. When i saw our opening deployment in game, i could barely see MTG's division way out in front me and i'm not sure that i could see Mark's division at all. The ground my troops were on was on a long low ridge and had good woods in the center and off the far and right and left to use a landmarks to guide friendly forces into position and serve as connecting points for the division. Plus, and this was a bit selfish, in ordering the redeployment it meant that i did't have to move the troops under my direct command at all really, just a few simple shifts to post batteries. This gave me more time to reconnoiter the north and south a bit. I think without this redeployment Pepe's original plan for the French would have caused us massive problems. As it was, and I'm finding is typically the case, we didn't know if we were winning or the losing the overall battle until a captured courier told us that we were! Because this seems to happen so often, I have a plan for dealing with that in future games that i won't share just yet. I know, right?! The KS guys have been very fortunate to not be exposed to the fullness of my persona due to no talking allowed in games. I'm an excitable fellow and am slightly competitive (understatement). But having to sit silently is a good change for me as it really does settle me down in games much more so than on the GCM. Plus, this is new to me so i'm still in the honeymoon phase. Not only do you retain your commission, but you have been granted the title Duc d'Klernitz! In the end, your decision to take a more direct line into the exposed enemy probably won us the battle. If you had taken the path as originally ordered, it would have taken you far longer to get engaged and while i feel you would stopped the French attack in the south, we wouldn't have had the crushing victory that we were able to achieve by capturing the high ground opposite our position and being able to drive the French into the river. You have permanently won yourself independent division command in any army i command! Which brings up an interesting point - in GCM one of the keys to winning is recognizing which players are good/not so good at certain things as well as their overall style of play (i.e. aggressiveness/passive, etc..) With KS Naps, it's like starting over in terms of learning people's traits and characteristics, who does what well, etc... So this is something of a new learning experience and I'm already taking mental notes for future use/exploitation! Thanks Digby, appreciate it and very much looking forward to another battle this afternoon. It was with some consternation for sure that i accepted command of the army. Further, about midway through the game I had Marshal Ney at Waterloo syndrome and was stuck in the fighting more than i was commanding the army. I'm really loving this and after 3 years of near daily GCM games this is such a refreshing change of pace. Looking forward to doing it again later today hopefully! Morsey wrote: Finally I got them to the battle and they got spanked. Also does anyone know where I can find some instructions on the command map functions. From every situation in live I try to learn something, so it was not too bad. I think this post from Kevin it is very good to learn the basics, then you need to practice and ask to the more experienced players.